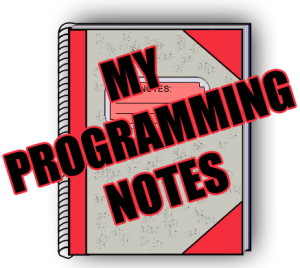 My Programming Notes is a collection of personal notes and actual homework exercises that has been completed over the course of my college career. It was written as a means to provide simple examples, which fill in missing or weak topics taught in textbooks/classes to help individuals better understand various programming concepts; most of which I myself may have had trouble initially understanding at first. Many pages contained within this site are useful for reference, but should not be regarded as literal tutorials. As a result, some pages may not contain step by step instruction, but I’m working on expanding them. I have personally learned many new things while surfing the internet, and hopefully this site can do the same for others. If you have any questions or concerns, feel free to contact me. Note: My Programming Notes is not run by “experts.” All source code is provided “As Is.” This site was created for the purpose to post notes for the benefit of others.